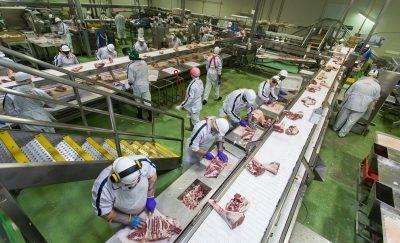 There’s an urgent need for development of government policies that ensure the reliable availability of affordable energy to all sectors of the Australian economy, including the red meat processing sector, the Australian Meat Industry Council says. AMIC chief executive Patrick Hutchinson said energy cost and supply was the most significant and pressing concern for the Australian red meat industry, which is dealing with increasing costs, limited energy competition and limited ability to implement cheaper and more sustainable options. “A reliable supply of affordable energy is a national necessity and should be a priority for the Federal and State Governments,” Mr Hutchinson said. “Endless squabbling and backflips serve no one. We need good solutions and we need certainty,” he said. Red meat processing is an energy-intensive activity, and sharp increases in the cost of energy in Australia are putting significant pressure on the ability of processors to remain profitable, and globally competitive. AMIC is the peak council representing retailers, processors and smallgoods manufacturers and is the only industry association representing the post-farmgate Australian meat industry. Mr Hutchinson said AMIC members were coming to him every day with concerns around energy supply and cost. Among concerned members were businesses like Australian Lamb Company (ALC) in Victoria, which is trying to deal with rising energy costs so it can continue to employ more than 800 people in the state. ALC is a leading lamb and mutton processing company based in Colac, and Sunshine, in western Melbourne with a workforce of 820 employees across the two locations. In the calendar year of 2017, ALCs energy costs (electricity & gas) increased by more than 100pc compared to 2016. This represented an increase of $1.2 million in cost to the company’s bottom line. ALC operates an export-accredited, fully-integrated processing facility with a capacity of 60,000 lambs per week. More than 80pc of ALC Colac group’s production is exported, to more than 60 countries. The company is the leading employer in the township of Colac. To help mitigate the rising electricity costs, the company implemented a $3 million Solar Panel project across both sites which is now covering 25pc of its electricity needs. The payback on this investment is 6-7 years, which is well below the payback on other projects itcould have invested in, the company said. However, management felt, as a business, that it needed some certainty (which is not available in the current regulatory environment) and could not incur continued unanticipated price increases like those recently experienced, chief financial officer Dale Smith said. “The increased energy costs we have recently incurred, and continue to incur, means there will be more times during the course of the year we will need to reduce hours and therefore jobs as the company cannot make the margins we need to continue operating,” Mr Smith said. The concerns for rising energy costs are not isolated to the red meat industry, but across the whole post-farmgate supply chain, AMIC said. The Australian Agricultural Manufacturers Alliance (AAMA), which represents the shared interests of agri manufacturers, has created a list of five key priorities, with energy right at the top, Mr Hutchinson said. The AAMA alliance was created to represent the shared interests of agri manufacturers and contribute to recognition, growth and sustainability of the sector. “On behalf of our members we are calling on government to commit to the supply of energy from an effective, competitive market, without monopoly behaviour, including in remote areas,” Mr Hutchinson said. “The Government needs to prioritise a review of the market structure and market rules for energy supply, with an ideal outcome being the limitation of the ability of energy suppliers to game the market. It also needs policies that encourage the meat industry to innovate in its energy investments, especially in regional environments, Mr Hutchinson said.